No safari in Tanzania would be complete without a safari in the world-famous Ngorongoro Conservation Area. While Ngorongoro Crater is the crown jewel within the Ngorongoro Conservation Area, surrounding attractions such as Empaakai Crater and the Ndutu region make it a popular destination year round. 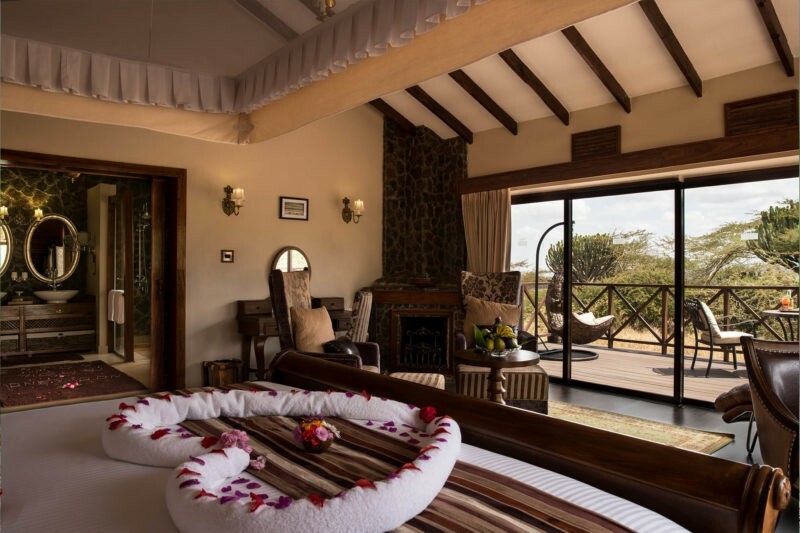 Whether it's a day-long game drive in Ngorongoro, observing the Wildebeest Migration calving season in Ndutu, or an extended Ngorongoro Highlands trek, you're spoiled for choice when it comes to accommodation in and around the Conservation Area. As one of Tanzania's most popular destinations, there aren't many budget Ngorongoro accommodation options. In fact, camping is the only option for those on a budget. With Shadows of Africa providing the camping equipment and a private chef to feed you, you'll be comfortable ahead of your Ngorongoro crater safari. Recommended For: Budget conscious travelers. 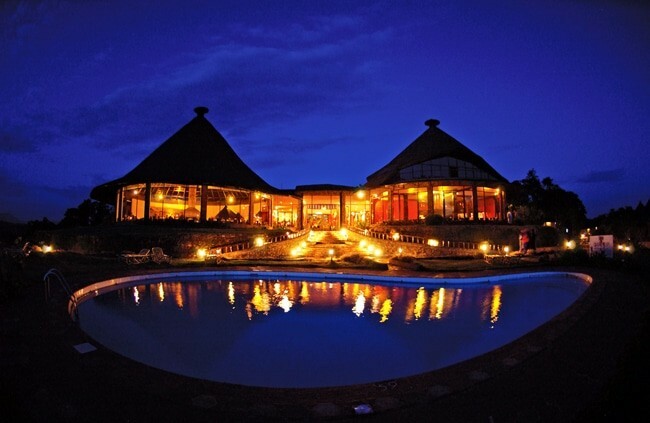 Shadows of Africa can recommend two medium style lodges on the Ngorongoro Crater rim. For those wanting an early start into Ngorongoro, both Rhino Lodge and Ngorongoro Wildlife Lodge are fantastic bases. The most affordable Ngorongoro hotel, Rhino Lodge has been a favourite with Shadows of Africa clients for almost a decade. All twenty-four of Rhino Lodge's rooms have a private veranda overlooking the natural beauty of Ngorongoro. With Ngorongoro being quite chilly at times, every room has a wood-burning stove for warmth. The bar has two roaring fires to warm yourself by after a long day on safari. Rhino Lodge also offers a range of walking safaris for their guests. From short crater rim walks to longer day trips. Recommended For: Budget conscious travelers who don't want to camp. The Wildlife Lodge chain offers visitors to Tanzania an affordable way to experience the country's national parks. A larger hotel with eighty rooms, Ngorongoro Wildlife Lodge offers no-frills accommodation with an astonishing view of the Ngorongoro caldera. Recommended For: People who want a stunning view. With the cost of Concession Fees and the limited real estate, it's no surprise that luxury hotels dominate the Ngorongoro hotel scene. 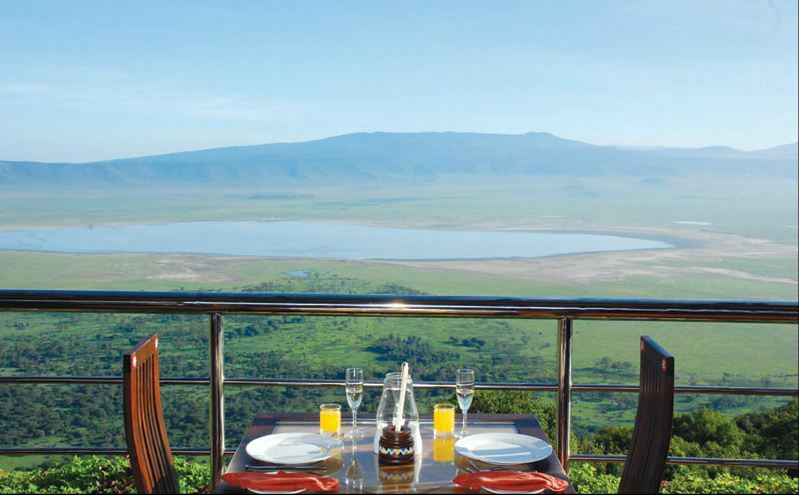 From affordable luxury chains to the truly decadent, there are plenty of Ngorongoro crater rim hotels to choose from. Sopa Ngorongoro represents entry-level luxury, offering the same world-class service and comfort you'll find in any one of Sopa's African properties. 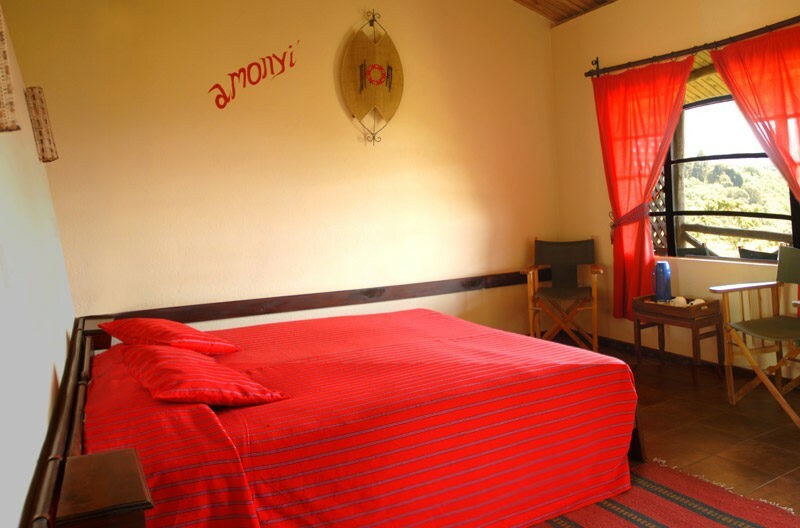 A larger property, Sopa Ngorongoro is perfect for families with young children who might need a little extra entertainment. The pool is popular with young and old alike! Guests can enjoy both buffet and al a carte dining at Lemala Hill Restaurant, while Crater View Bar is a great place for a post-safari sundowner. For those who want to experience an Ngorongoro tented camp, Angata Ngorongoro is the best option. An intimate camp with just eight tents, it's a great place to get away from the tourist crowds and enjoy the natural ambiance of Ngorongoro. Guests can enjoy a hot cup of Tanzanian grown coffee in the lounge or sit by the crackling bush TV (campfire), making for a serene experience you won't find in a larger lodge. 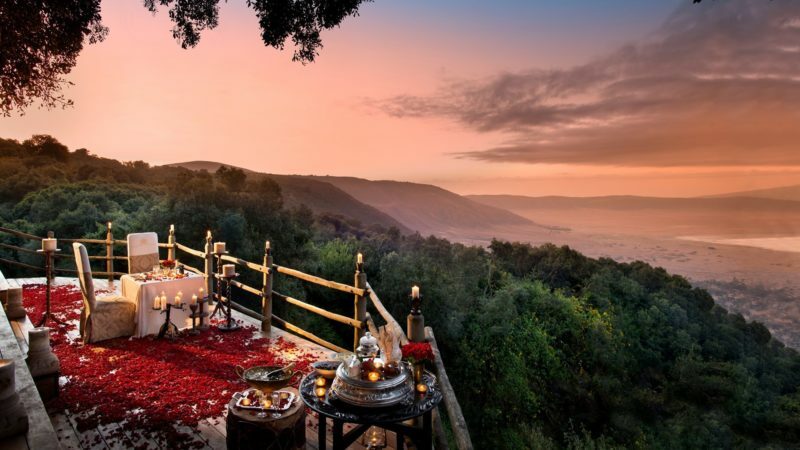 Serena represents East Africa's most popular luxury hotel chain, and Serena Ngorongoro is arguably their most beautiful property in Kenya or Tanzania. Serena Ngorongoro offers guests the luxury experience you would expect in the world's best hotels. 24-hour room service, an extensive selection of activities, private balconies overlooking the crater, and delicious meals in the main restaurant all ensure you're experience western comfort and African hospitality. Recommended For: Travelers who want a little luxury and the comforts of home. Tanzania has some truly stunning 'top luxury' properties, and the Ngorongoro Conservation Area's unique landscape makes it the perfect place to splash out on some truly lavish and unique hotel experiences. 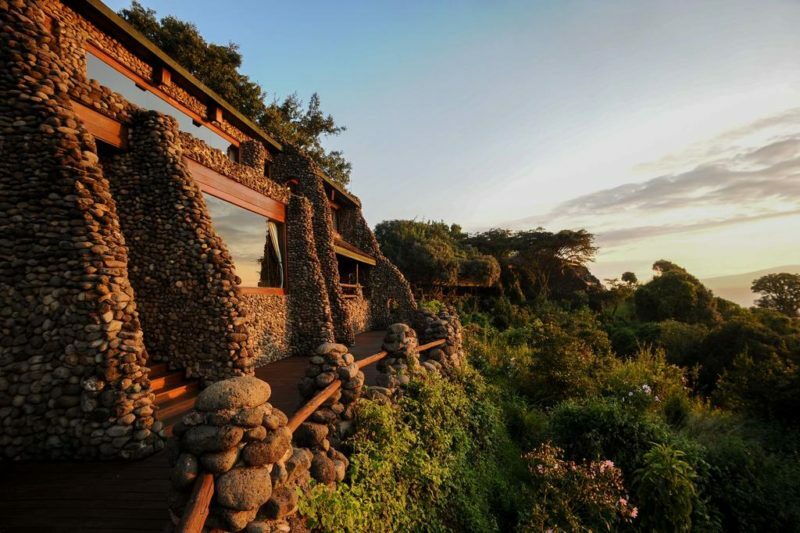 A truly unique Ngorongoro hotel, The Highlands by Asilia offers guests privacy and complete immersion. Set on the slopes of Olmoti Volcano, The Highlands is situated far from other Ngorongoro camps while still affording you easy access to the crater floor. 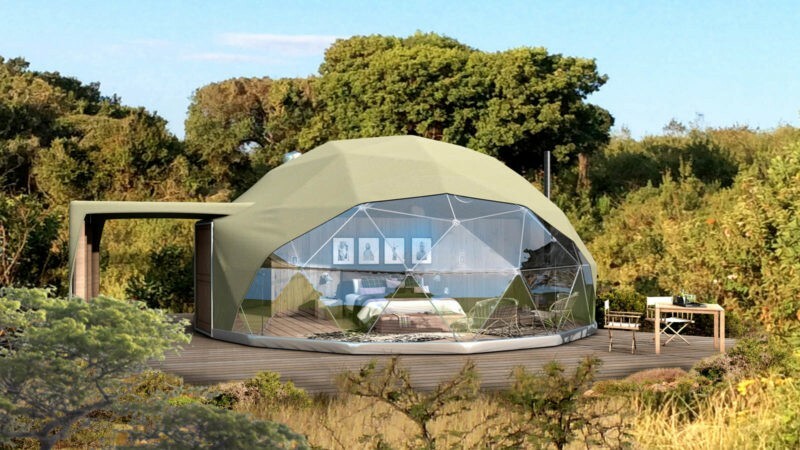 The eight domed tents have floor to ceiling windows to showcase the area's natural beauty as well as king-sized beds and ensuite bathrooms for your comfort. If you are looking to splash out on something special, The Highlands is a good fit. Recommended For: People wanting to escape the crowds. &Beyond is the first name in luxury safari accommodation, and Crater Lodge is the ultimate in Ngorongoro luxury accommodation. Divided into three small camps with a total of thirty tents, Crater Lodge specializes in giving its guests personal experience while ensuring maximum privacy. Everything from private butlers to Persian rugs to in-room massage to gourmet dining is combined to give a truly unforgettable accommodation experience. Recommended For: Honeymooners and romantic escapes. What we would call 'entry level top'luxury', Lemala Ngorongoro offers a uniquely luxurious experience at a substantially reduced price tag when compared to Crater Lodge and Highlands. One of our most requested luxury properties, Lemala's tented camp is a cut above the usual tented camping experience. While you're still sleeping and dining in tents, the lavish interiors make it feel like you're in a five-star hotel. It's the perfect blend of luxury and closeness to nature. Recommended For: Adventurous luxury travelers. Located just a short drive from the entrance to the Ngorongoro Conservation Area, the quaint town of Karatu offers an affordable gateway to Ngorongoro Crater. Without the sometimes hefty WMA fees and additional park entry fees, you can find some stunning properties for a fraction of what you would pay inside of the park. For those operating on a tighter budget, staying in Karatu Town is a great way to be close to Ngorongoro Crater without having to pay the Concession fees. Offering affordable accommodation with none of the frills, Crater Rim View Inn provides a comfortable place to rest your head before or after your game drive. While it isn't lavish, Crater Rim View has been hand-picked by Shadows of Africa as the best low budget hotel in Karatu. Recommended For: Backpackers and budget travelers. 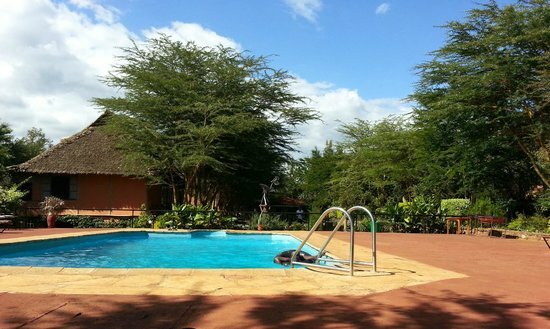 If you have a little extra money, Eileen's Trees is a fantastic and fun place to stay in Karatu. With its gorgeous gardens, locally inspired dining, and gregarious owner, Eileen's Trees is equally good for backpackers on a budget or families looking to save some money. The garden and swimming pool offer a great place for young and old alike to while away their afternoons. Recommended For: Families on a budget and flashpackers. Karatu excels when it comes to medium hotels at an affordable rate. 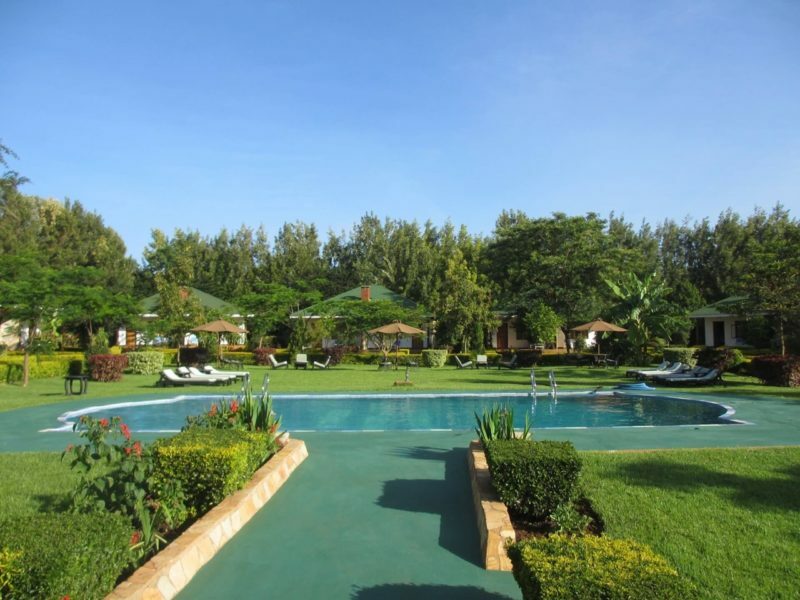 There are a variety of options ranging in price, so you've got plenty of options when planning your stay in Karatu. One of Shadows of Africa's favourite lodges in Karatu, Country Lodge offers comfortable rooms set within gorgeous gardens. The best part? The delicious food prepared by the hotel's owner and head chef. Set away from Karatu Town, you have the benefit of being outside of the Conservation Area while still feeling apart from the noise of the town. 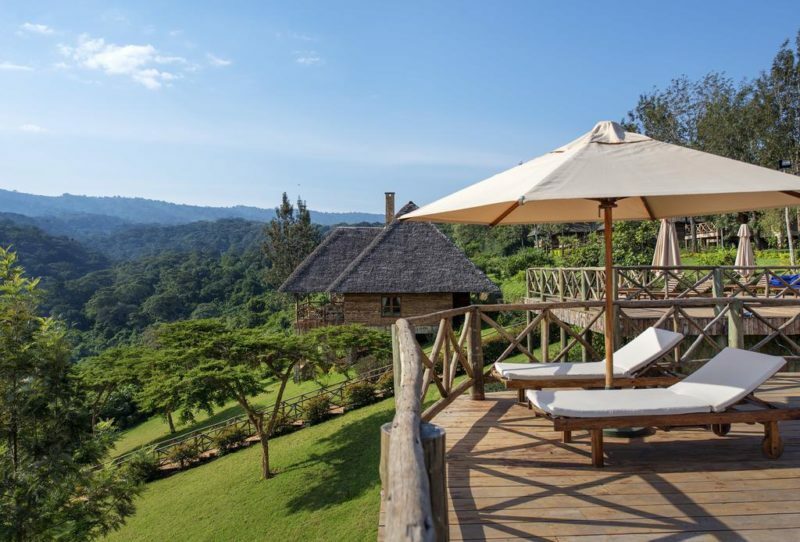 If you've always wanted the experience of staying in a Colonial style coffee plantation, Ngorongoro Farm House by Tanganyika Wilderness Camps is what you're looking for! Set in a 500 acre coffee plantation, Farm House boasts a swimming pool, guided coffee walks, and old world charm in spades. A sister lodge to Country Lodge, Bougainvillaea Lodge is a slightly more upmarket property with 32 quaint cottages for its guests to enjoy. By far the most popular part of Bougainvillaea? Its large pool and garden area! 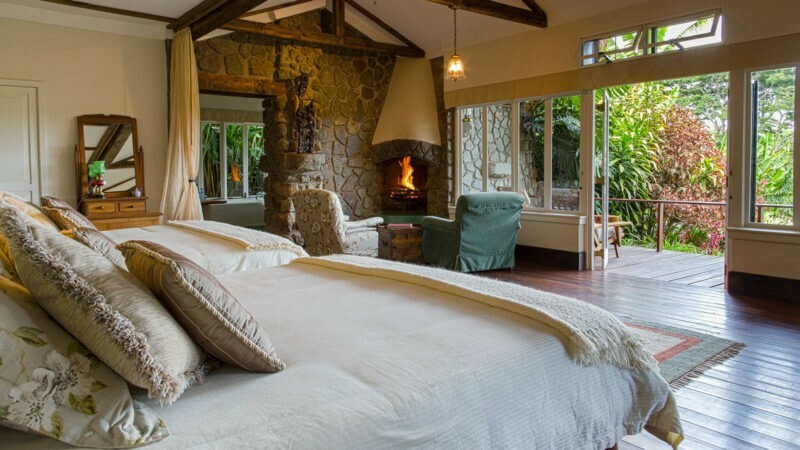 A truly gorgeous property set in the midst of well-manicured gardens, a coffee plantation, and a working organic farm - Acacia Farm Lodge is a beautiful escape from the hustle and bustle. Each of the private villas is secluded in the gardens, the food is delicious, and the staff are world-class. 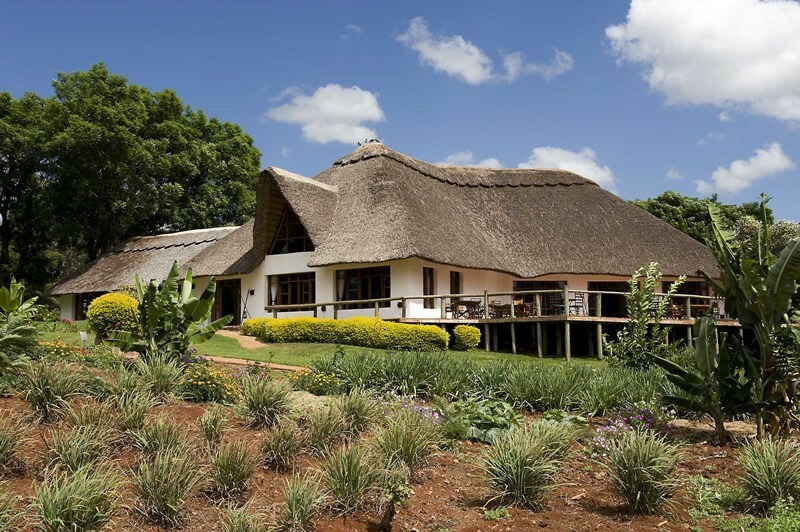 For those looking for a luxury experience without paying a fortune, Acacia Farm Lodge is an excellent choice. Recommended For: Getting away from it all. There are a number of luxurious options in the Karatu region, but we've highlighted three of our favourites for your consideration. A part of the popular Wellworth Group of hotels, Oldeani Mountain Lodge is the best of the medium hotels in the Karatu area. On-site amenities include a spa, billiards room, internet cafe, swimming pool, and children's activity room. There's even nightly Maasai dance and drum performances to look forward to! If you're looking for affordable luxury in Karatu, Oldeani is the way to go. A seamless blend of African wilderness and colonial charm, Gibbs Farm is an award-winning lodge providing guests with comfort, privacy, and a sense of closeness to nature. Each of Gibbs Farm's cottages comes with a fireplace, hand-carved furniture, and both indoor and outdoor showers. Each is also uniquely decorated, so no two rooms are alike. If quaint, rural charm is what you're looking for, you've found it at Gibbs Farm. Located just outside of the Ngorongoro Conservation Area gates, Neptune Ngorongoro gives you luxury accommodation just a stone's throw from the park entrance. Each of Neptune's twenty log cabins is a spacious retreat away from the hustle and bustle of the working world, and guests are sure to love the mix of Indian, Mediterranean, and local cuisine available at Acacia Restaurant. Recommended For: Large groups and families. Experience the glory days of colonial Africa with a night at The Manor by Elewana. A bucket-list worthy hotel offering guests the chance to stay in an Old World style mansion, The Manor lives up to its name and then some! 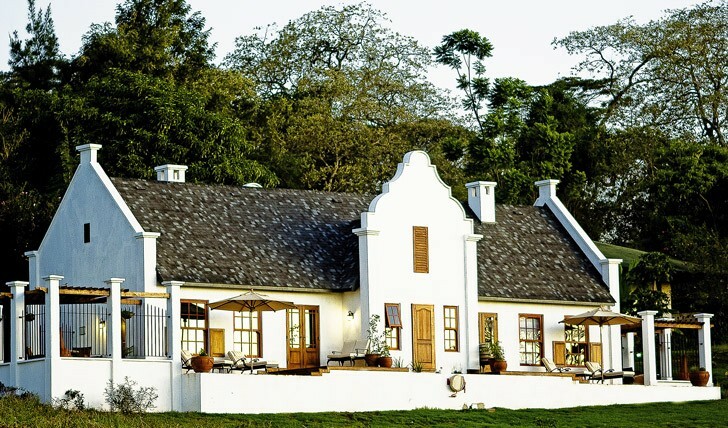 In addition to its comfortable cottages, The Manor offers guests access to activities such as coffee plantation tours, horseriding, mountain biking, and gourmet dining. As you can see, there is a wealth of options when it comes to accommodation both inside the Ngorongoro Conservation Area and in nearby Karatu. The region truly boasts Tanzania's most diverse offering of hotels and prices. This entry was posted in Tanzania, Tanzania and tagged ngorongoro accommodation, crater rim hotel ngorongoro, karatu hotels, where to stay ngorongoro.